After many months of social media absence, the jihadi group Jaysh Muhammad in Bilad al-Sham under Abu Obeida al-Masri has recently advertised its presence in the city of Idlib city as part of the Jaysh al-Fatah jihadi-rebel coalition that conquered the city and other parts of Idlib province from Assad regime forces. 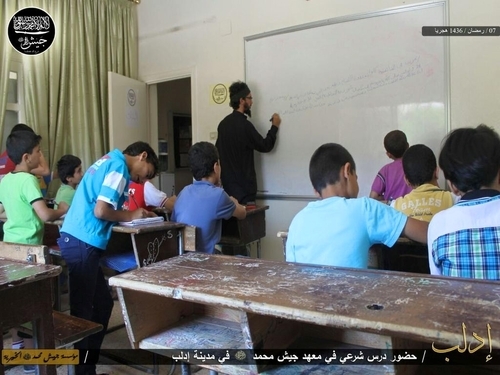 Jaysh Muhammad-run Shari'a Institute in Idlib city: lesson for children. On its official Arabic Facebook page, the group describes itself as "to support our people in al-Sham" (echoing the full name of Syria's official al-Qa'ida affiliate Jabhat al-Nusra) and "on the direction of our Sheikh Osama bin Laden (may God have mercy on him) and following on from him, hakim of the Ummah Dr. Ayman al-Zawahiri (may God protect him)." Thus, though on its French language Twitter account the group might describe itself as "neutral" in the fighting between Islamic State and Jabhat al-Nusra, it is in practice closer to the latter as similarly aligned ideologically with al-Qa'ida. Indeed, these latest pronouncements appear to confirm what I noted many months ago where the group's leader reportedly said he only had allegiance to Zawahiri, despite being suspected of Islamic State sympathies on account of the lack of open confrontation between the two sides. The latest evidence also seems to confirm the account of the group's shift westwards following the withdrawal from its original stronghold of Azaz in north Aleppo province on the border with Turkey. In theory and reality, official neutrality is now a totally incoherent stance: the only reason Jaysh Muhammad and the Islamic State's predecessor ISIS could co-exist in Azaz in 2013-2014 was because ISIS' stances on allegiances were still not clearly absolute and enforced back then: with the official proclamation of the Caliphate in June 2014 came the pronouncement of the obligation for the annulment of all group identities and allegiance to the Islamic State. In contrast, Jaysh Muhammad was a useful ally in 2013 in expelling what ISIS saw as the greater problem: the Northern Storm Brigade.